Yes, Allersearch® products are non-toxic solutions that are safe for people, pets, and the environment. No, tannic acid is a natural product found in oak bark, coffee, cocoa, red wine, and tea. In the past, it was believed that tannic acid was tea-colored. Although tea contains tannic acid, purified tannic acid is a pale yellow color. Allersearch ADS™ has not been found to stain carpets when used according to its Directions for Use. However, precautions should be taken by testing Allersearch ADS™ in an inconspicuous area before treating any surface. What effect will the Allersearch® Treatment have? Effective control of asthma and allergic rhinitis can be achieved by following your doctor’s medication plan. It is also important to reduce trigger factors where possible. Allersearch® products reduce major triggers found in the household. What areas of the house should be treated with Allersearch® products? All upholstered furniture and carpets should be treated with Allersearch® ADS™, ADMS™ and X-Mite®. Clothing, bedding, towels, and curtains should be washed using Allersearch® Allergen Wash. When dusting, apply Allersearch® AllerDust™ to your feather duster or dust cloth to prevent the allergens from becoming airborne. 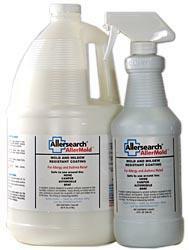 Apply Allersearch® AllerMold™ to surfaces that are exposed to high humidity or moisture to prevent the development of mold and mildew. To eliminate odors use ODRX™. Also, because of their thickness, mattresses and pillows should be encased in mite proof encasings for optimal protection. Who is most likely to benefit from Allersearch® Home Allergy Treatment? 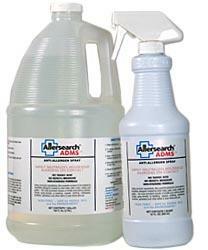 Anyone who suffers with allergies or asthma can benefit from Allersearch® Home Allergy Treatment. The Allersearch®Home Allergy Treatment reduces one of the major allergy triggers-allergens from the house dust mite, as well as those from pollens, mold, mildew, and cat and pet dander. Effective control of allergies and asthma can be achieved by following your doctor’s medication plan. It is also important to reduce trigger factors where possible. All Allersearch® products are safe for people, pets, and the environment.